After It Happened One Night, Claudette Colbert seemed to make a career out of playing plucky heiresses with minds of their own, which sums up her character well in this romantic comedy. 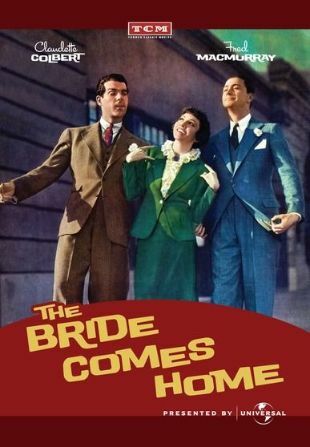 When her wealthy father goes broke, Jeanette Desmereau (Claudette Colbert) decides she should find a job of her own, applying for work as a writer at a magazine edited by hot-headed Cyrus Anderson (Fred MacMurray). Jack Bristow (Robert Young), one of the staffers, tells Cyrus about Jeanette's misfortunes, and while he's not initially swayed by this tale of woe, Cyrus buckles under and hires her, primarily because Jack has lobbied strongly for her (which might have something to do with the fact he finds her attractive). While Jeanette and Cyrus don't get along well at first, when the irresistible force meets the immovable object, something has to give and before long the two fall in love. Cyrus and Jeanette make tentative plans to marry, but when Jeanette decides to do Cyrus a favor and clean up his very sloppy bachelor apartment, Cyrus becomes furiously angry and calls off the wedding. After this, Jeanette is just as angry with Cyrus and Jack, waiting in the wings, steps in; she impulsively decides to marry Jack, and they hit the road for Indiana for a date with the Justice of the Peace. Cyrus realizes just how big a mistake he has made, and points his motorcycle toward Indiana to stop the marriage before it's too late.